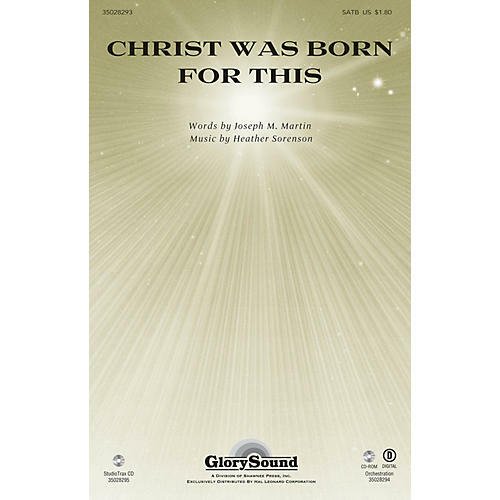 Uses: Christmas, Communion Scripture: John 3:16; Isaiah 7:14; Galatians 4:4 The final words, Christ was born for this, from the traditional carol, Good Christian Men, Rejoice, form the foundational textural concept of this new carol. The carol's tune is realized in minor and expressively altered reminding the listener that Christ was born for a divine purpose. We find ourselves looking beyond the manger to the cross. The music is cinematic in character and brings a soundtrack aspect to this message of grace. The interweaving of In Dulci Jubilo and Carol of the Bells is masterful. StudioTrax CD containst Accompaniment, Split-Track, & Full Performance. Available separately: SATB, StudioTrax CD, Orchestration CD-rom (Score & parts for Flute 1&2, Oboe, Clarinet 1&2, Bassoon, Horn 1&2, Trumpet 1, Trumpet 2&3, Trombone 1&2, Bass Trombone/Tuba, Timp, Perc 1&2, Harp, Violin 1, Violin 2, Viola, Cello, Double Bass). Duration: ca. 3:26.